Want to brighten up your garden in Winter? I spent a glorious sunny afternoon at RHS Garden Wisley on Friday. The light was fantastic with the low sun and it really highlighted how some plants come into their own at this time of year. Around the lake there are many varieties of willow (Salix) and dogwood (Cornus) which literally glow when the light catches them. Look at how wonderful this Salix ‘Yelverton’ looked…. Salix look particularly good near water – it somehow highlights the stems more, perhaps because the light is also reflecting off the surface of the water. Other willow varieties with particularly gorgeous stems are Salix alba ‘Britzensis’, Salix daphnoides and Salix alba subs. 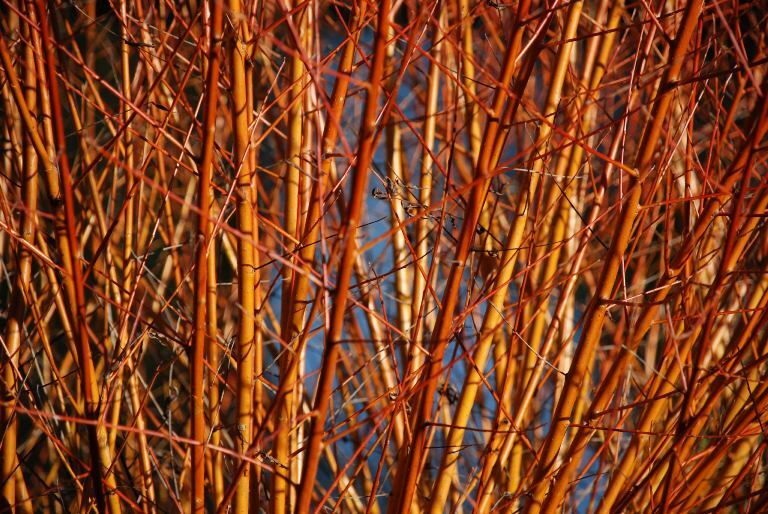 vitellina but there are others that also look fabulous such as Salix irrorata which has blue-white stems that really look fabulous when planted against something that shows off their luminous colour. Cornus are also brilliant plants for the Winter Garden. 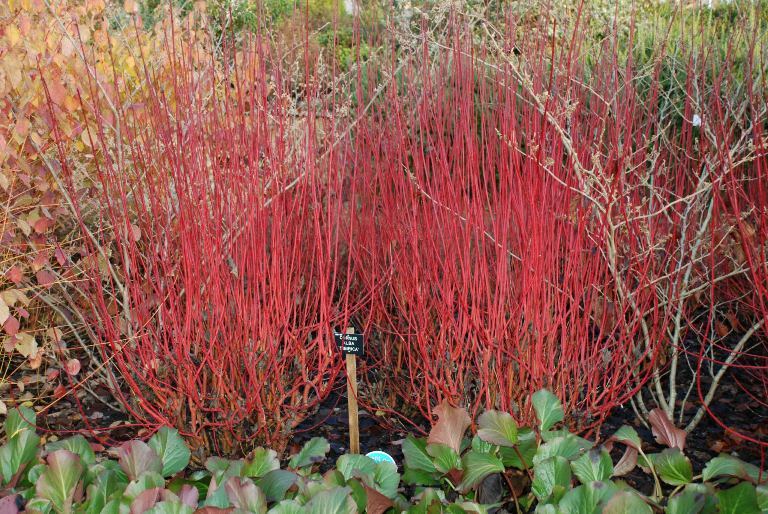 Cornus alba ‘Sibirica’ is probably the most common with its gorgeous red stems They look fabulous planted in larger groups preferably where the stems are able to catch the Winter sun. This picture was taken at Saville Garden last winter, a great garden to visit at this time of year….they have a fabulous gift shop there too, great for Christmas shopping! Other dogwood varieties are Cornus stolonifera ‘Flaviramea’ which has wonderful greenish-yellow stems and Cornus alba ‘Elegantissima’ boasts deep red stems with the added interest of soft variegated leaves in the Summer. Despite its slightly dodgy name (!) 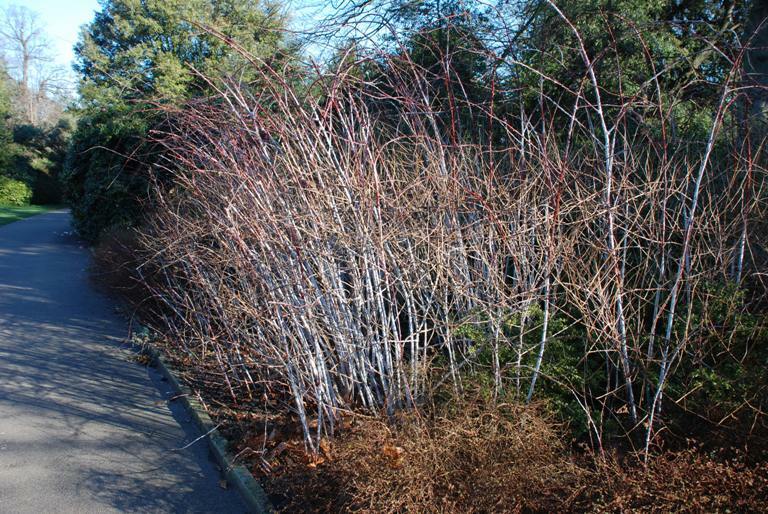 Rubus cockburnianus looks fabulous in the Winter – its white stems really reflect the sun if you can plant it with, for example, Cornus alba ‘Sibirica’, the contrasting colours adding an extra dimension to the Winter Garden. This picture was taken a couple of years ago at Kew Gardens. Rubus are brambles so if you don’t like prickles they are best avoided. They need room too so they’re not particularly ideal for small gardens where planting space is precious. Rubus thibetanus also has prickly stems that turn white in the Winter. This is only a small collection of plants that have ornamental stems but I hope you see that the Winter Garden doesn’t need to be lacking in colour. There are many trees with fantastic bark, for example, which can look fabulous planted with Cornus or Salix. Silver birch looks gorgeous with both!